during recording or while playing a memo. automatically stop recording once track 9 is completed. • Press the Power/Play button. Down button until selected track appears on the display. • Press the Quiet/Record button twice. seconds if a button is not pressed. Example: Poor - Road - Surface. Mode alerts will be displayed as a regular radar alert. beep the closer or stronger the radar source. The more “|||” the closer the laser source. activated to measure the speed of a targeted vehicle. and the display shows PULSE (like the picture above. tern continues for as long as the signal is present. mode before it will detect VG-2. radiated signal and becomes undetectable by the VG-2. Every 30 seconds, the detector checks for a VG-2 signal. two beeps are provided, indicating an “all clear” condition. be received (Reference page 19 & 20 for VG-2 information). the VG-2 warning will override the X band alert. All user features can be reset to factory settings. •Unplug Power Cord from unit. •Press and hold Power and Quiet. •Plug Power Cord into unit. •Release Power and Quiet buttons. 3. Dim/Dark Mode to full illumination of display. 4. Auto Quiet Mode OFF. 5. VG-2 Detection Mode OFF. 8. Vehicle Battery Saver ON. 9. Full Power Up sequence. 13. Unit ON or OFF. NOTE: Must calibrate compass after resetting features. refer to the troubleshooting guide below. PROBLEM: No display or audio. • Check fuse for lighter socket; replace if necessary. • Make sure lighter socket is clean. PROBLEM: Unit alarms when vehicle hits bumps. • Check for loose lighter socket; tighten and clean. defective cord to the factory. on the back of the lighter socket. PROBLEM: Unit gives laser alert when accelerating. PROBLEM: Audio alerts are not loud enough. • Cancel Auto Quiet Mode or City Mode. (see page 8 & 9). before returning your unit for service. light trucks (under 10,000 lbs.). over 18,000 lbs. and in Illinois in trucks over 26,000 lbs. abrasive cleaners on the units exterior. the VG-2 is known as a “radar detector detector”. for speeding, the other for possession of a detector. area regarding the legality of the use of radar detectors. t 15 of the FCC Rules. ’s authority to operate the equipment. this product other than those set forth in this warranty. arising from the use, misuse, or operation of this product. 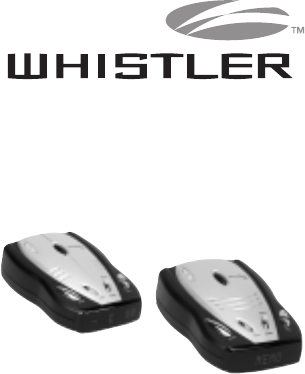 stations for Whistler brand detectors other than Whistler. Please allow 3 weeks turnaround time. CODs will not be accepted! then picked up by the radar gun’s receiving section. 24.250 GHz), and Ka Band (33.400 - 36.000 GHz). not transmitting on any one of the above radar bands. report this new gun where other detectors cannot! laser detection at short range. of you, chances are your detector won’t either. most often used at short range. guns which operate at a laser wavelength of 905 +/- 10mm. receive an alert, response time should be sufficient. are being used, no detector can provide a warning. a known distance is measured. performs self-test but does not respond to radar”). • A copy of your dated store receipt or bill of sale. 3. Be certain your unit is returned with its serial number. in the following space: s/n_______________. Units without serial numbers are not covered under warranty. • The units original warranty has expired. • Dated store receipt is not supplied. • The unit has been returned without its serial number. improperly, or had its housing removed. 1783 Dimensions: 4.65” L x 2.95” W x 1.45” H Weight: 6.8 oz. 1793 SE Dimensions: 4.65” L x 2.95” W x 1.45” H Weight: 6.8 oz. Vehicle Battery Saver, 30mA nominal. POP™ Mode is a trademark of MPH Industries, Inc.
and email address (if applicable). visit the FAQ’s at www. 2003 The Whistler Group, Inc.
handling (per order) $5.00 Prices are subject to change without notice.